Our patented formula that we use in our OdorKlenz powders is simple, safe, and effective. 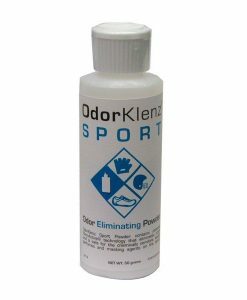 Utilizing fast odor- removing technology, OdorKlenz Sports Powder can be used in a wide range of sports equipment from stinky sneakers, and other odor absorbing materials such as helmets, pads, workout gloves, and other sports equipment that cannot be washed conventionally through the washing machine. OdorKlenz has the solution to the stinky shoe issue. We have an innovative product that is formulated and targeted just for deodorizing and removing shoe odor. Without the use of toxic chemicals and perfumes. There is no need to spray your shoes in an over-perfumed mist while you hold your breath. Equipped with a convenient flip-top dispenser, OdorKlenz Sports Powder is ideal for easy, quick application. The quick-drying formula will make sweaty sneakers a thing of the past. No need to go out and spend a fortune on new shoes or athletic equipment. Our patented formula is safe and chemical free, leaving no heavily perfumed odor behind. OdorKlenz has the solution to the stinky shoe issue. Deodorizes and removes shoe odor. No toxic chemicals and perfumes.